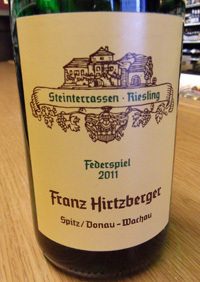 2011 Weingut Franz Hirtzberger, Riesling “Steinterrassen” Federspiel Wachau, Austria. This was my first chance to taste the Hirtzberger wines, and was tutored through them by Franz Hirtzberger which heightened the experience no doubt, but even in the cool eye of reflection these wines were totally remarkable and extremely moving, especially the set of 2011 Rieslings. While, I’ve always been a fan of the dry Austrian whites and have adored the charming Gruners and dusty Rieslings of many producers, these Hirtzberger wines stood out, in not head and shoulders above in many cases, and rival some of the great Brundlmeyer Rieslings. The entry level Federspiel Steinterrassen from Hirtzberger really rocks and shows unique terroir character, making it a great starting point if you’ve never had Austrian Riesling with racy acidity, minerallity and is comfortably dry and crisp. The nose shows orange blossom, truffle and wet stones leading to a palate that is lively and fresh with green apple, lime, melon and tangy stone fruits with a hint of tropical essences. The texture is refined and this stunning Riesling leaves a lingering apricot pulp and citrus finish with clear transparency and pureness. Great now, but can go another 5-8 years, gaining added complexities in the bottle. 2009 Vineyard 29, Cabernet Sauvignon “Aida Estate” Napa Valley. Vineyard 29 is a stand out in 2009, with all their wines showing amazingly well and with great potential to develop in the cellar medium term, their Estate needs a good 5 years to truly show it’s magic, but the sleeper and wonderfully textured Aida Estate may be the one to watch. For those that want to put a few special bottles away, may want to grab some of Vineyard 29’s Aida Estate Cabernet 2009 and enjoy the rewards in about 3 or so years, and those that are patient might want to hold it for closer to 10 years to see all it’s glory. The 2009 Aida Estate opens with force and intensity with pure Cabernet character and power starting with acacia flowers, black fruits, incense, earthy truffle and black olives leading to a palate of creme de cassis, blackberry, blueberry and plum while sweet toasty Taransaud and other French wood barrels add quality and ease the tannins. The Oak plays a starring role here in this wines youth, but should fall back over the next 3 or so years to allow near perfect balance, though in this wine it is certainly pleasant and welcoming even now. Side lines of licorice, tobacco leaves, sage and pencil lead add complexity and the finish is simply stunning in length and class, honestly this might be the best 2009 at this stage that I’ve tried from Napa top echalon of producers. 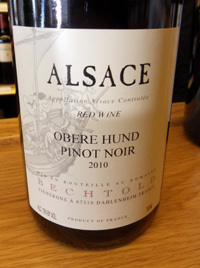 2010 Domaine Bechtold, Pinot Noir “Obere Hund” Alsace, France. Bechtold’s Pinot Noir is light, bright and spicy, but really gets rolling with air and should develop nicely in the bottle over the next few years. The nose starts with tangy cherry, dried roses, pepper and loamy earth before a palate of light color, delicate layers of plum, raspberry and cherry fruits with truffle, tea spice and forest floor notes. This light to medium bodied red needs air and swirls to come alive, but it is a rewarding Pinot that gives you a mystery to unwrap and by the time it is finished you want it even more. This wine proves to be a deliverer of it’s terroir and this winery that makes natural style wines from organic vines is one to watch in the coming years. The organic movement in Alsace has become mainstream and while the wines continue to evolve, there are many magical wines to discover there. 2009 Domaine Habrard, Crozes-Hermitage AC, Rhone Red, France. Laurent Habrard’s beautiful Crozes Blanc and Rouge are now available in the States and are a worthy collection to explore, especially this 2009 Crozes-Hermitage Rouge that Return to Terroir is importing to our shores. The 2009 Habrard Crozes is a wonderfully textured Syrah with loads of terroir and character and best of all, at a great price for such a detailed and lovely wine. The nose is deep with earth, spice, flowers and fruit essences leading to a beautiful palate of violets, pepper, game, truffle and round fruit with blueberry, black cherry and boysenberry while hints of hot bricks, plum sauce and kirsch linger in the background. The chalky minerals and herbs cut a nice path mid palate, but the finish brings the fruit back to the fore and the balance is suburb. 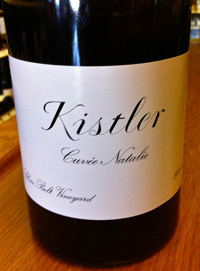 2008 Kistler, Pinot Noir “Cuvee Natalie-Silver Belt Vineyard” Sonoma Coast. I’ve had a few Kistler’s over the years, but this was my first chance to try the Cuvee Natalie, and taste Kistler’s Silver Belt Vineyard fruit, and I was left very impressed, this 2008 is a real class act, no question. I really can’t think of another Sonoma Coast 2008 other than Cobb that I like better than this wonderful Pinot from Steve Kistler and his team. The nose is pure and there is deep aromas of roses and sweet tea spices along with smoky French oak, baking spice and vanilla leading to a round and supple palate of silky red fruits which include cherry, strawberry and poached plums with flashes of game, earth and balsamic notes. This wine is all about texture and length and still has good balance with bright acidity that is subtle and smooth. This is a great effort, and a very rewarding wine, I only hope I get to try it again. 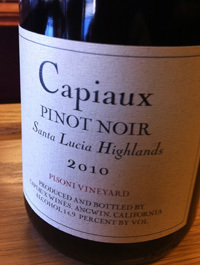 2010 Capiaux, Pinot Noir “Pisoni Vineyard” Santa Lucia Highlands. If a big wine can be reserved then Sean Capiaux has made it with this 2010 Pisoni Pinot, as it does have the usual depth and concentration, but seems refined and balanced at the same time. The nose is full of briar, incense and loamy earth leading to a dark palate of black cherry, plum and blueberry fruits with hints of mountain berry, bramble, anise and tea spices. This full force Pisoni has more weight to put on in the next year or so in bottle, but it seems pretty round and the texture feels silky already. Fans of this wine and or vineyard will love this version and vintage, and it just might win over some new folks as well with the lovely and lengthy finish that goes on and on. With the years higher acidity, things look good for this wine to keep improving and getting more detailed over the next 5 or so years, I know I plan to follow it a while myself. 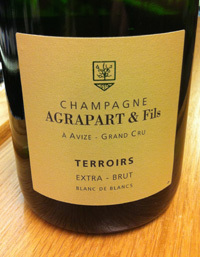 n.v. Agrapart & Fils”Terroirs” Grand Cru Blanc de Blancs, Extra Brut Champagne, A Avize, France. Champagne Agrapart & Fils is maybe the most underrated, under the radar Champagne marque out there, but that just means the price is still fair and affordable and you are able to get a stunning sparkler under $50, a Grand Cru no less! I was blown away by Agrapart’s latest releases, these are cutting edge and thrilling sparklers that impress for balance, life and vibrancy along with depth and class. The latest Terroirs Extra Brut sizzles with fresh lemon and citrus, but opens up to nutty brioche, toast, apple and pear fruit with a perfect mousse leaving a hint of creaminess. This bright and minerally Extra Brut is a no dosage beauty with nice tension and dynamic personality. I image Grand Cru Chablis with bubbles, but regardless this is as good as Champagne gets in Non Vintage. 2007 Kapcsandy, Estate Cuvee, State Lane Vineyard, Yountville, Napa Valley. This vineyard, planted and started by Helen Turley and her husband for Lou Kapcsandy has become one of the so called First Growths of California and is up there with Harlan and Screaming Eagle as one of the top wineries in the State. The wine meets every expectation and is wonderfully textured and amazingly deep. This Cabernet blend is the third tier wine in their lineup after the Grand Vin and Roberta’s, but it is as good in this vintage as anything you might find in Napa bar none. The color is darkly purple and garnet and the palate has layers of richness with cassis, currant, blackberry, plum and cherry fruit, while lovely cedar, tobacco leaf, licorice and smoky wood add complexities to this fine and Bordeaux like wine. While very Californian, this wine really does have that Left Blank style of Pauillac or Margaux, and I think it shows balanced tannins and it doesn’t get too heavy, keeping it pure and lively. Denis Malbec, formerly of Chateau Latour is making the wines at Kapcsandy and he has brought a light touch and helped put the label to the top echelon and the latest releases look to even be better. 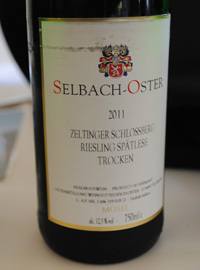 2011 Weingut Selbach-Oster, Riesling “Zeltinger Schlossberg” Spatlese Trocken, Mosel, Germany. This groovy dry Riesling is my Thanksgiving pick, and I certainly endorse it completely for any occasion you might feel the inch for a quality Mosel. This wine from Zeltinger Schlossberg is vibrant and tropical with sizzling intensity and focus which makes for a wine full of racy acidity, mineral spices and bright/tangy fruit. The nose has orange and white flowers with lemon/lime, verbena, passionfruit, white tea, green apple and lime with wet stones, flint and salty chalk notes. The fruit and acidity match up nicely here giving a textural depth that is hard to find in dry Mosels and still bone dry and full of energy, this is a fantastic Riesling that might be hard to do every year, but is the reward of a good vintage. Johannes Selbach is reaching new heights with this currant set of wines and the offerings are more than his usual great selection of fine Rieslings, especially his single block collection wines like Rotlay and Andrecht, it really is silly to not try Selbach-Oster 2011, as these wines are beyond stunning! The big Thanksgiving bonus is that this freaking good wine is under $30, for which I’m truly grateful. Happy Thanksgiving 2012. 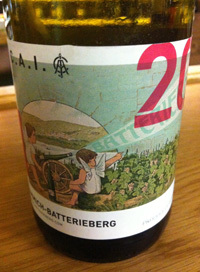 2011 Weingut Immich-Batterieberg, C.A.I. Riesling Kabinett Trocken, Mosel, Germany. This beautiful and starkly dry Riesling comes from the blue slate soils of the lower Mosel and is a modern style with loads of acidity and mineral notes, frankly it is one of the best dry style wines I’ve tried from the Mosel. Mosel wines usually need a bit of sugar/sweetness to balance them out and I like the depth and texture it gives, but this wine doesn’t want for anything and is a real pleasure from start to finish. The chalky stones impression and minty lime essences really come through on the palate along with Asian pear, green apple and peach pit as well as tropical mango, tangerine and apricot fresh and skin. This wine sizzles with bursting electric energy from it’s core of acidity and crisp dryness that never seems out of place and with it’s salty and savory edge it begs to be sipped repeatedly, this is a must have for Riesling Freaks!